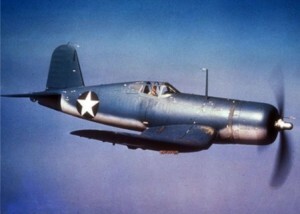 Navy pilot Ensign Robert R. Hirshkind was killed instantly when his F4U-1 Corsair, (Bu. No. 02368), crashed on the farm of Wallace Foster in the town of Exeter, R. I. Ensign Hirshkind had been on a formation training flight out of Quonset Point Naval Air Station when the accident occurred. Approximately 12 miles south-west of Wickford the flight encountered thick overcast that dropped nearly to the ground. The accident occurred as the flight was descending through the overcast on instruments. Ensign Hirshkind was assigned to Night Fighter Squadron 75, (VF(n)-75).